A melting pot of influences and characters with music ranging from luscious and sweet melodies to broad walls of sound, from drum and bass to funeral marches, from fairytale ballads to calypso. The musical glue binding it together are the 17 musicians that power the vibrations and their universal passion for improvisation. 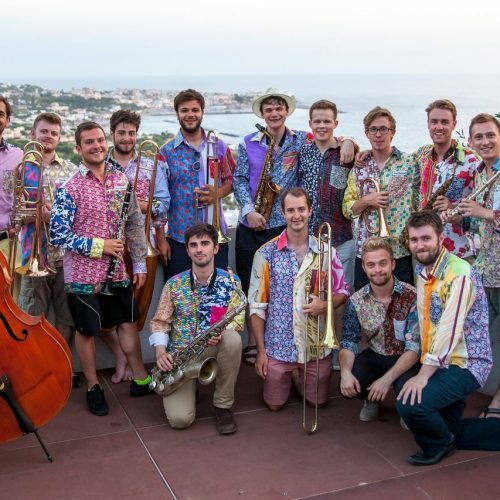 James Davison, Adam Chatterton, Christos Stylianides, Sam Warner – trumpet, Kieran McLeod, Tom Green, Jamie Pimenta – trombone; Yusuf Narçin – bass trombone, Tom Smith, Ronan Perrett – alto saxophone, Riley Stone-Lonergan, Will Howard – tenor saxophone, Tom Ridout – baritone saxophone, Liam Dunachie – piano’ Billy Marrows – electric guitar, Calum Gourlay – double bass, Scott Chapman – drums. Patchwork Jazz Orchestra are a London-based millennial big band which has a variety of composers using the ensemble as a platform for fresh sounds and ideas. A factory of sound, materialising the musical fantasies of a new generation of jazz musicians. As a leader and sideman Tom Green has performed alongside musicians such as Iain Ballamy, Gareth Lockrane, Steve Waterman, Kit Downes, Issie Barratt and Mike Gibbs, and is a member of groups including the Misha Mullov-Abbado Quintet and Troyk-estra.